Ever see a Rimfire KB before? I hadn’t. Until today. Customer brought in a Walther with a “Problem”. 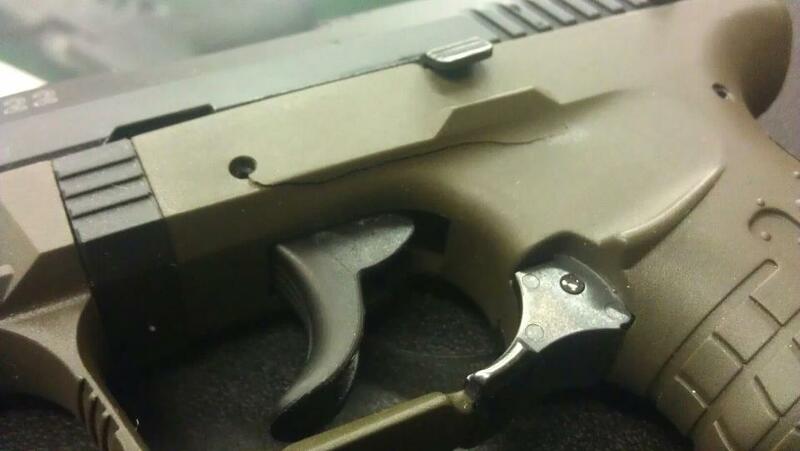 The KB cracked the P22's frame and subframe is damaged. This isn’t just from one bad round. The customer had a second piece of brass that looked exactly like the first. When we have a KB, there are are two Culprits we look at… The Gun or The Ammo. Most of the time, the Ammo is the cause. Remington Golden Bullet Bulk Pack. I don’t have a lot number or anything. 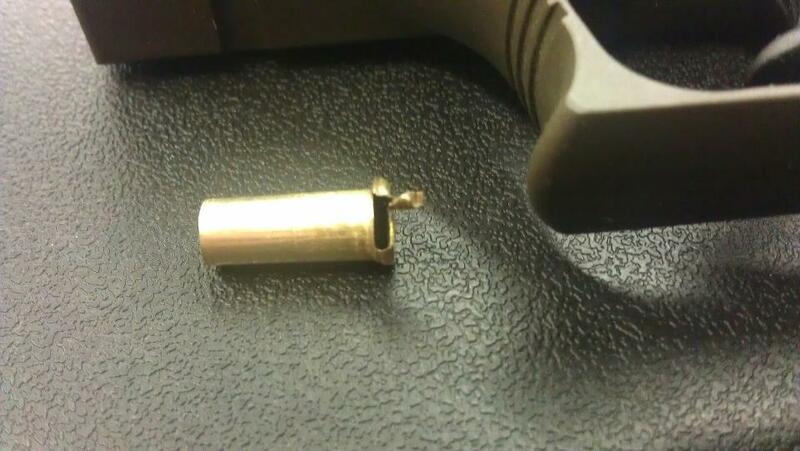 The Customer Cleaned and Lubed the gun, fired several magazines full with no problem and then suddenly had a jam… then another jam and the slide wouldn’t go forward with the magazine in. Then he noticed the frame and the brass. Looking at the brass, the way the casing was blown out like that… I think we have some cases that were double primed. If it was fired out of battery, the brass would be blown out differently and distinctively, indicating it… in this case, the primer material in the rim blew out the rim. A normal amount of primer wouldn’t do this, and there isn’t enough case volume for a double charge… but the pressure spike from too much primer – would do exactly this. Luckily no one was hurt, nothing else was damaged. We’ll see what Walther and Remington does. The gun shop I work at is now stocking (Well, we got in a few of them) the Henry US Survival AR-7. Normally, I’d avoid anything having to do with Henry rifles… Not that there is anything wrong with them, I just don’t favor them. I don’t like Ranch Dressing either. Nothing wrong with it, I just think it tastes like rotten mayo made for the devil’s own excrement… So it’s just a matter of taste. Everyone likes different things, and this is why the Gun Industry has such a wide varieties of ways to kill things. 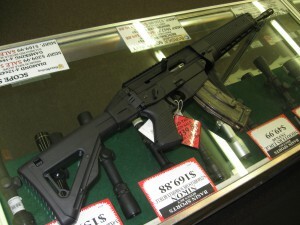 The AR-7 was originally made by Armalite for the US Air Force. The idea was that this was a part of a Pilot’s survival kit should they be downed in a nice woodland area filled with tasty furry critters so the pilot could have a couple days of hunting before they get picked back up. (Yes, that was intentionally tongue in cheek) I don’t know how many the Air Force picked up, but they did buy a few. But not enough for Armalite to hold on to the gun… They sold it to Charter Arms for couple hundred bucks and a bag of roasted walnuts. Charter made them for a few years and then just stopped. Henry picked up the old design and is now making a slightly improved version. Armalite, Charter, and Henry… this is a trifecta of Uncomfortable Dislike for me… As I am not fond of anyone having anything to do with this rifle. Yet there is something about the little AR-7 that I like. It’s very light, simple, and it does what its designed to do perfectly. The gun its self though, is far from perfect… its sights are poor, its action is overly heavy and gritty, and its trigger… well, I have a house full of wall switches that have a better pull… Yet there is something about the collective whole of the little rifle that is most appealing. It’s not that it is light, because it balances very awkwardly with it’s fat hollow asymmetrical stock. It’s not that it’s cheap… you could buy a number of other .22 rifles that are more accurate and better built… just better rifles… for the same price as an AR-7. And it’s not that I am planning on flying over Russian Wilderness on some mission that might get me shot down. And it’s not that “It Floats”… because I was diving once in a lake and found one of these on the bottom. (Okay, I had found an older Charter and it was filled with water… Evidently Henry has improved the Floating qualities) I’m not planning on going Kayaking with a rifle. The AR-7 has an intangible quality to it… something I can’t quantify… but it’s there. It’s Cool. The AR-7 rifle is a Cool little rifle. It’s stripped down and simple, like a rifle version of a Cafe Racer type Motorcycle. Being Cool, the AR-7 makes no apologies for not having a forearm, good trigger, or decent sights… it doesn’t have to… because it’s Cool. I’d love one if it had a folding stock instead of the bloated hollow stock. And I’d love it even more if someone made a version in .22 Magnum. Your new .22 Pistol will sell very well. But what would do better… would be to make it in .22 Magnum. People keep asking for the KT PMR-30… and KT can’t deliver the volume. Make your SR-22 pistol an SRM-22, in .22 Magnum with night sights and a real high capacity magazine… and you would have a ferocious Home Run Hit on your hands. Ruger has announced a couple new guns. Let’s take a look at them. The new “All American Rifle”. Link Here. I don’t have anything good to say about this one. Congratulations Ruger, you just made a Savage Axis. Bravo. But 10 bucks says the Savage has the better barrel. Hopefully the stock is more rigid… more like TC Venture. Hopefully it wont get a Recall like the TC Venture either. The new SR-22 .22LR Pistol. Link Here. If it’s one thing Ruger has always done well, it’s making .22 Rimfires. Rifles and Pistols. Now, while this pistol looks a lot like a Walther P22 and Ruger has made an industry out of other people’s designs… (Just like the Soviets!) this SR-22 is a apparently, shockingly, a new design. Given Ruger’s Rimfire history, I’d expect this pistol to be a good one. Iffy trigger, but otherwise it should be solid, it will also probably have a reasonable retail price so it is one I’m looking forward to seeing. Considering all the other Tactical .22 Pistols out there… The Walther P22, SIG’s Mosquito, and others… This will be a welcome new seat at the table. Because right now, the Ruger Mk III pistols, Browning Buckmarks, Beretta NEOS pistols and the new ATI-GSG and SIG 1911 .22’s are the only Semi-Auto .22lr pistols worth buying. That’s a thin selection. I wish Ruger all the best with this one. 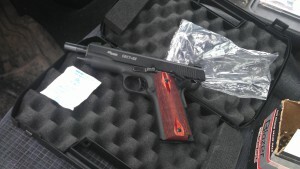 My buddy Fenris purchased a SIG 1911 in .22. 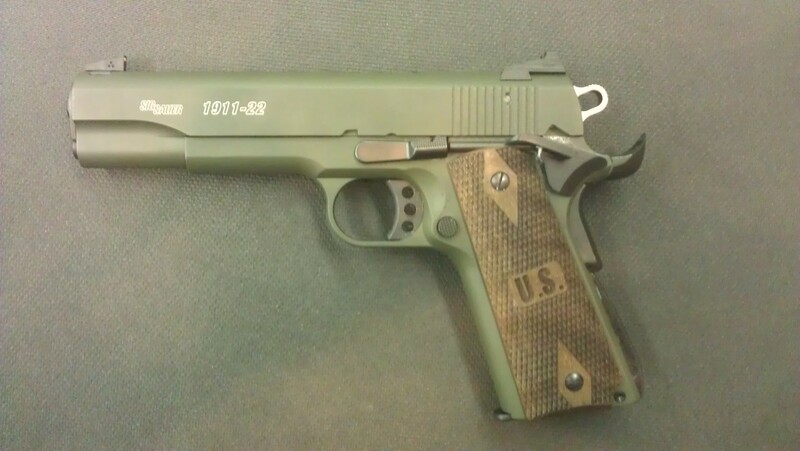 It’s not really made by SIG like their other 1911 pistols, but it’s made by GSG for them. The other GSG’s are imported by ATI and are otherwise identical to the SIG, save for Grips and other Markings. Now SIG has a new version… One I like a bit more. Oh baby… That’s a good looking .22 Rimfire pistol right there! Yes, t really is green… OD Green with simple walnut wood grips. A quick look at “Tactical .22” rifles. For some reason, this segment of the shooting community has exploded. Because evidently classic .22 shooting just isn’t cool enough anymore. You have guns like the Ruger 10/22, the Marlin Model 60, the Marlin 39A Lever Action, or something simple like one of the excellent CZ bolt actions…. but no… they are not “TACTICAL”. Let me tell you, the Lever Action was Tactical before the word was invented. Because if “Black with Rails” means Tactical then I guess it’s not. If Tactical means it can be applied with tactics, or if it’s user friendly and provides actual utility in different situations, then absolutely. Well, some folks think it’s all about the AmTracks… so we have to roll with as many rails as possible to be even more tactical. I mean, hell, we have Rails for our Rails because no one is making a gun with enough rails so we have to add more. Anyways, the rifles. Let’s take a quick look. 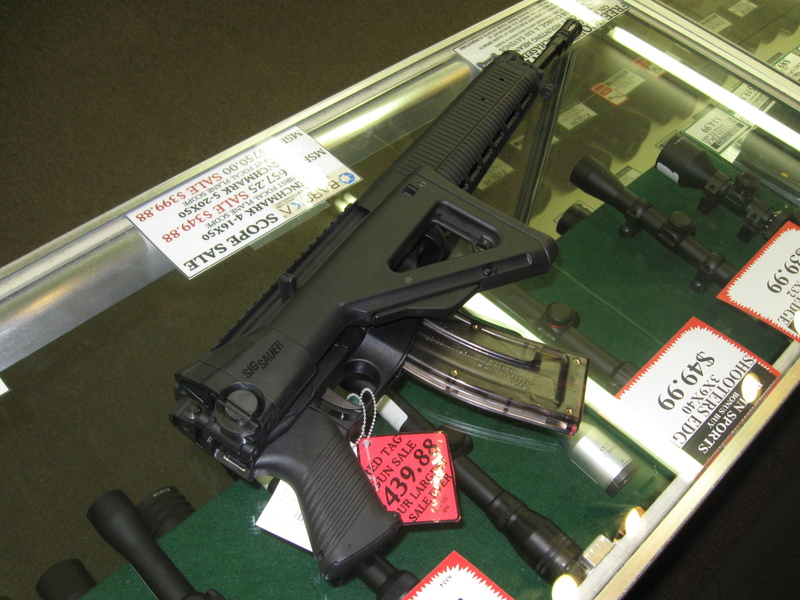 The SIG 522 is probably the most underrated of the tactical .22’s on the market. It gets great reviews from a lot of folks… owners love them… NuttinFancy did like a 3 hour Holiday Special on the bloody things, yet I can’t sell the last two we have to save my life. I have shown them and shown them to guys… and guys always buy the S&W MP15-22 instead. Always. Don’t get me wrong… the S&W is a great .22 rifle. But the SIG has a handy little trick that the Smith can’t do. If you do this with your Smith - it wont be covered under warranty. No, I’m not supposed to advertise our sales price on these, because it’s below MAP… But we just want to blow these last two guns out. We’ve not sold one in over 6 months. I have two left. If you want one, I’ll hook you up and throw in a couple goodies to go with it. We got here a Llama .22LR. It’s very 1911’ish, small, and cute as hell. The action feels well worn, and the finish is about 80%… but the gun still feels solid and it should shoot just fine. We took it in for a hundred bucks… Marked it for 220 bucks. It has the box, all that, and two spare magazines. My question is should we mark it for more? I mean, dang… this thing is adorable. I don’t know if a lot of guys have seen these… they are pretty cool. It’s a .22LR version of the HK 416, as a pistol. It’s like any other AR pistol type… meaning it’s cool but awkward and would take some time to get used to it. 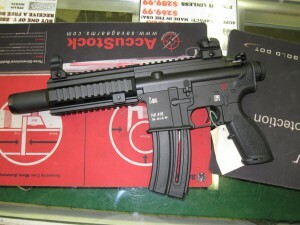 The HK 416 for those that can't afford the real deal.